There is often nothing better than the beautiful curve ball that music throws at you from time to time when you hear a track, make an assumption as to its origin and then find out who recorded it. Over the last 40 years there have been several tracks, not always remixes, that have reinforced an artist's true genius and innovation. A great example is when an artist you don't associate with dance and electronic music makes a sublime dancefloor killer track. Not all of the tracks below are in the euphoric 'hands in the air bracket' but they are impressive for their time. The tracks below are possible opinion changers as when you see who released these tracks you might feel differently about them. There are lots of bands that on the surface we see as rock or pop but underneath have a real funk to them, The Police being such a band. 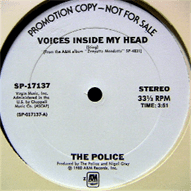 With reggae and to some extent blue eyed soul influences, The Police were not short of talent. Well before Ashley Beadle and other contemporaries got to work on the trio's track on their third official album it sat there largely unnoticed in among the chart topping hits. Beadle's reworking alongside Roger S and E-Smoove totally upped the tempo to the classic U.S. house sound of that period, yet the original slower, dubbier, original version has stood the test of time better. Various releases followed and mashups followed, making this track even more of a club essential from a band who has split up over thirty years earlier bar for a short reformation in 2007. Let's not forget that beyond The Frog Chorus and Mull of Kintyre, Sir McCartney has released some very inventive music in his time. Some of his earlier solo output had a dance music leaning with producers such as John Jellybean Benitez and Arthur Baker undertaking the remixing duties. 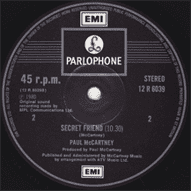 Before such luminaries got their hands on McCartney's tracks it was a 12 inch b side that stands out above the rest. On the flip side of Temporary Secretary, which in itself is a great track, Secret Friend is unlike any other track of its time. Sounding like something Detroit's Carl Craig would produce it is a subtle piece of electronic music that would be perfect for the laid back after hours DJ set. The track features McCartney's vocals through a delay but you would be forgiven for not noticing that as it swirls and mixes with the jazz, dance and electronic influences. Rock and dance have often flirted with each other and it wasn't until the likes of Primal Scream and Andrew Weatherall combined that the DJ-band connection was set in stone. Until then it was often left to the producer or the band to make that transition, and often it wasn't until later that the dance like influences were coaxed out. Sampled a decade later by The Corporation of One's 'Is this the Real Life' which was a classic post rave dance track, this again is a hidden B-side. The track is not too far away from the influences of 70s krautrock yet it is paced enough to make it fit for the dancefloor. The track builds and builds with a wicked bassline and accompanying eerie strings to make it stand out from pretty much any track of its time. Given that it appears as the b side to one of the Scottish band's greatest hits; 'Promised you a Miracle' you can see why this may have been drowned out in the hype. It did however appear a year earlier in 1981 on the Sons and Fascination LP. Much later on Moby gave it a reworking and it appeared on a Simple Minds Sunkissed Records ep titled; 'The Balearic Sound of Simple Minds'. The most popular of Krautrock bands were not without their dance-ability, in fact there is some great video footage of B Boys break dancing in a New York subway to Can's Vitamin C track. Throughout Can's illustrious and eclectic career they released an incredible amount of high quality tracks and could turn their hand to pretty much anything. 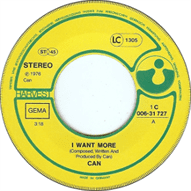 So in 1976 the German rockers turned even more towards electronic sounds and released 'I Want More' a superb take on the sounds coming from the Italo Disco and associated scenes. The track kicks off with a pure cheekiness and most Can fans at the time would have been hard pressed to spot the identity of the release. Thirty seconds into the tune it opens out with glorious 'hands in the air' moments that may be cheesy but do the job. Can's one appearance on Top of the Pops was playing this complete with Irmin Schmidt in a silver disco jacket and the eccentric Holger Schüring on double bass. Released as a seven inch, it was a further five years in 1981 when it was pressed onto 12 inch for the dancefloor. In the search for breaks and beats, DJs stumbled onto a track by a british art rock band from the early seventies that would place the Hertfordshire group into hip hop history. 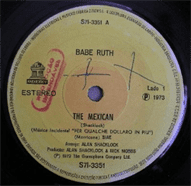 The Mexican was already renowned but first appeared on many youth's radars after featuring on early hip hop footage and documentaries, with mentions in the 'Founding Fathers' documentary to name but a few. Appearing on the 1972 First Base album it was later released as a seven inch a year later. The track starts off like something from a Spaghetti Western before unleashing a heavy, mellow drum track and rolling guitar riffs. With fierce vocals by Jenny Haan, the tracks drops out before kicking back and the return of the relentless dancefloor beat. A few re-edits and remixes appeared almost forty years later but it was The Bombers in 1978 on the dance imprint West End Records that helped the original reach a new crowd. Both the original Babe Ruth and The Bombers versions are worthy of a play out on any dancefloor. Hip hop as a music culture has been more successful than any other for capturing tracks by artists who were not part of any black, urban or dance scene and bringing them into the fold. The various breaks and beats complications that have come out of over the years a testament to that. Whilst everyone's definition of what a dance track is will vary, there is no doubt there are many tracks that have appeared on such as Too Slow to Disco and fall under various umbrellas such as Balearic, yacht rock and blue-eyed soul. Discovering these tracks is one of the greatest buzzes a DJ or music collector can get. I was at the Standon Calling festival about five years ago when my DJ friend was playing a track that to me sounded like Carl Craig. After chatting with him I found out it was the Paul McCartney track mentioned above. I then made it my mission to track down this incredible piece of electronic music that was ahead of its time. Such as the Simple Minds track, I had owned the 12 inch for many years before one day flipping it over and instantly thinking; "The Corporation of One sampled this". Whether you are hunting for killer tracks with our Trackhunter app or tool, searching a record shop or YouTube, finding these rare tunes that were ahead of their time is worth the effort and the joy that follows.